our company has created a strong foothold in the field of manufacturing and supplying Kitchen Working Table with Over Shelves. As the name suggest, these kitchen working tables come with over shelves for the convenience of the user. Specially designed by experts, our kitchen working table with over shelves is a utility product that are used for cutting, chopping, sorting and general purposes. 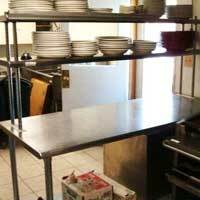 These kitchen working tables with over shelves are provided with splash guard, overhead shelves, under shelves, and drawers & doors optional. why our kitchen working table with over shelves?